German-American draughtsman and painter, born in Berlin. Studied drawing at the Dresden Academy 1909-11 and at the School of Arts and Crafts in Berlin 1912-14; also for several months in 1913 at the Atelier Colarossi in Paris. 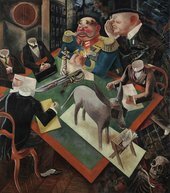 Served in the army 1914-15 and again briefly in 1917, but spent the rest of the war in Berlin where he made violently anti-war drawings, and drawings and paintings attacking the social corruption of Germany (capitalists, prostitutes, the Prussian military caste, the middle class). Played a prominent role in the Berlin Dada movement 1917-20 and collaborated with John Heartfield and Raoul Hausmann in the invention of photomontage. First one-man exhibition at the Galerie Hans Goltz, Neue Kunst in Munich 1920. Many of his drawings were published in albums (Gott mit uns, Ecce Homo, Der Spiesser-Spiegel etc. ), and he was subject to prosecutions for insulting the army and blasphemy. Visited the USA in 1932 to teach at the Art Students League, New York, and settled there 1933. In the latter part of his career he tried to establish himself as a pure painter of landscapes and still life, but also painted many compositions of an apocalyptic and deeply pessimistic kind. Returned to Berlin in 1958, but died there a few months later.